Renowned for oddities like roaming chickens and declaring itself the sovereign “Conch Republic,” Key West is a popular tropical destination with a unique culture all on its own. The southernmost tip of the continental United States is home to the only living coral reef in North America. Filled with heritage architecture and other cultural attractions, Key West also features colorful sunsets and some of the best snorkeling and diving in the country. Locals and visitors enjoy boating, swimming and other water sports in the balmy, aquamarine Gulf of Mexico and Atlantic Ocean. Offshore excursions give vacationers and locals alike a way to experience adrenaline-pumping action and views of the captivating undersea world, the famous sunsets and the pristine backcountry of the Florida Keys. You can also step back in time and see Key West from the water just like buccaneers, wreckers and other seafarers have for centuries. When your travel plans bring you to Key West, consider adding one or more of these top water adventures to your vacation itinerary. History buffs, outdoor enthusiasts and nature lovers will enjoy a trip to Dry Tortugas National Park aboard the Yankee Freedom III ferry. Famous for its history, the Dry Tortugas are home to the mid-19th-century Fort Jefferson, one of the largest coastal forts ever built. When used as a prison, the garrison confined Dr. Samuel Mudd, the physician who set John Wilkes Booth’s leg and was a conspirator to his crimes. The trip includes a ranger-led tour of this national historic landmark. The island chain and its coral reef provide a habitat for numerous seabird and aquatic animal species like brown pelicans and sea turtles. 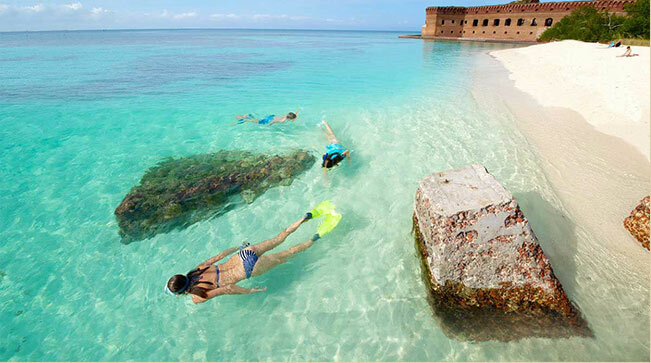 In addition to wildlife spotings, the Dry Tortugas are an excellent place to swim and snorkel to pristine waters of the Gulf of Mexico. Remember to bring a towel, sunscreen and a change of clothing. Climb aboard your own Jet Ski for an exciting high-energy trip around the island of Key West. Feel the wind in your hair and the ocean spray on your face as you view Mallory Square, the Historic Seaport and other popular sites during a 28-mile trek through the warm waters surrounding the southernmost point in the United States. You may also spot sea turtles, dolphins and tropical birds. Bring a swimsuit, sunglasses, sunscreen and a beach towel on this adventure. Although the tour is designed for the entire family, age restrictions apply. Younger family members will have to ride with an adult. One of the best ways to explore the waters around Key West on your own schedule is by hiring a private charter. An experienced captain can take you to one-of-a-kind fishing, diving and snorkeling sites based on an itinerary that caters to your specific interests. Head off shore to explore an undersea reef or into the mangroves in search of the fauna living in the Florida Keys backcountry. You can hire a powerboat or glide silently across the waves aboard a Key West Private Sailing Charter. These well-maintained vessels are available for morning or afternoon sailing excursions. Relax and enjoy the sun beneath billowing sails during the journey to the Key West National Wildlife Refuge. The experienced captain and first mate will be on the lookout for turtles, dolphins and more than 600 species of colorful sea life that inhabit the area. Your crew will also identify special points of interest throughout the journey. Enjoy a gourmet cheese platter or other light snacks while viewing the fascinating wildlife that inhabits the nature preserve surrounding the tropical oasis of Key West. You can help the crew raise the sails on the way out and take a turn at the wheel during the return voyage to the harbor. In addition to Key West’s amazing weather and beautiful sunsets, the city is also renowned for incredible sport fishing opportunities that beckon thousands of visitors each year. Indelibly linked to Pulitzer Prize-winning author and avid sport fisherman Ernest Hemingway, Key West is one of the country’s top deep-sea fishing destinations. The Florida Keys barrier reef is situated 7 miles south of the self-proclaimed Conch Republic. Beyond the reef, the Gulf Stream provides a steady flow of deep blue water loaded with an abundant array of fish species. Lasting from four to eight hours, a deep sea fishing charter can take you to one of these hot spots for the chance to catch Wahoo, tuna, marlin and kingfish. The charter includes a fishing license, bait and tackle. The number of large species in these waters increases the odds that you will land the catch of a lifetime while aboard a Dream Catcher Deep Sea Fishing Charter. During a Key West Sunset Cruise, couples can experience wonderful views and ocean breezes while sailing on the tranquil waters just off Key West. You can watch the sun dip below the horizon as the day melts away. Enjoy drinks and delicious gourmet snacks while watching the spectacular natural light show in the sky. Experiencing this event with a loved one on the waters is the perfect way to end the day. All you need is an island life attitude to board this cruise. Sail on a classically styled, wooden schooner while exploring the pristine waters of the Gulf of Mexico and the unique, biodiverse ecosystems of the Key West backcountry without power. Experience an authentic day of sailing aboard a tall, full-rigged vessel. Help hoist the sails, and take a turn at the wheel. You will also kayak through the mangrove forests and snorkel on a reef nursery teeming with wildlife. The trip is subject to favorable weather conditions and includes a delicious buffet lunch. Bring a swimsuit, sunscreen, a beach towel and a change of clothes. Plan accordingly as an adult must accompany children. The warmer months of the year are the best time for the entire family to experience the beautiful aquatic scenery off the coast of Key West. This excursion is an environmentally responsible dolphin watch and snorkeling adventure. Watch dolphins frolic, feed in their native habitat and swim beside the boat. At the Key West wildlife refuge, you’ll have the opportunity to see more than 600 species of fish and other marine creatures while snorkeling the coral reef. Relax on the deck and soak up the Florida sunshine as the vessel heads back to shore. Be sure to bring a towel, sunscreen and lunch or snacks. Beverages and snorkeling equipment are provided. Hone your sport fishing skills during an exciting full- or half-day excursion to a wreck or reef site off the coast of Key West. During a trip with Dream Catcher Charters, you can target food fish as well as the numerous larger species of game fish that ply these waters. Improve your technique while you land barracuda, grouper and shark along with cobia, mackerel and snapper. Considered one of the most productive styles of fishing, wreck and reef fishing routinely produces plentiful catches. These trips include everything that you need: a professional guide, fishing license, bait and tackle. The charter’s t-top, restrooms and stocked cooler ensure your comfort on the water. The trip is customized based on the season and the location where the fish are gathered. Anglers of all experience levels will find the trip memorable and extremely rewarding. During a Classic Harbor Cruise, couples can travel back in time to enjoy the romance of sailing around Key West on the deck of a wooden schooner like seafarers from a bygone era. Take an unforgettable journey on a replica of the first vessel to win the famous America’s Cup from November to May. The ship boasts 3,600 square feet of canvas, teak decks and mahogany trim. Glide across the emerald waters of the Gulf of Mexico while enjoying commanding views of Fort Zachary Taylor and Malory Square. You will also see aquatic animals like dolphins and sea turtles. Pack a picnic basket and enjoy a leisurely lunch in comfort and style. A glass-bottom boat tour allows you to view the enthralling underwater world situated off the shoreline of Key West without getting wet. The specially designed seating and viewing windows give passengers a front row view of the vivid colors and the spectacular array of species that flourish in the local marine ecosystem. Witness the tropical fish, crabs, lobsters and turtles as well as North America’s only living coral reef.